Editor's note: Jim Evarts has kindly shared a second gallery of stunning crystal images taken using crossed polarisation filters. The author's first gallery is here. The pictures in the image gallery below were scanned color photos. The photos in turn were taken from 35mm slides projected on to a white wall. For the original slides, I used 35mm Kodak 100 ASA Elite Chrome film. They were taken through the microscope using a 25X Leitz plan objective and 10X eyepiece. The camera was used as a film transport with no lens attached. The initial magnification was approximately 220X (on the slide film). I used polarized light to bring out the colors and applied heat and pressure on the hyroquinone to form the crystals. Low heat is applied to the powdered mixture (using a bunsen burner flame 6 inches away). A small disc is put on top to apply pressure after first placing the heated compounds on a glass slide. 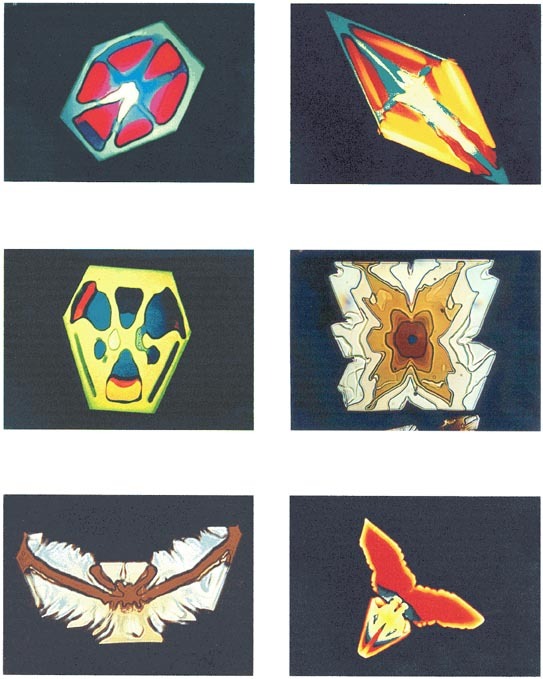 All the pictures are of the same chemical and the amazing thing is that each one is unique in both its shape and colors. Comments by e-mail are welcomed to Comments to the author sent via our contacts page quoting page url plus : ('jevarts','')">Jim Evarts. Editor's Note: Jim remarks that black and white film developers like Kodak D76 contain hydroquinone so this may be worth trying if pure hydroquinone is hard to source locally. Please take appropriate precautions as with all chemical handling. 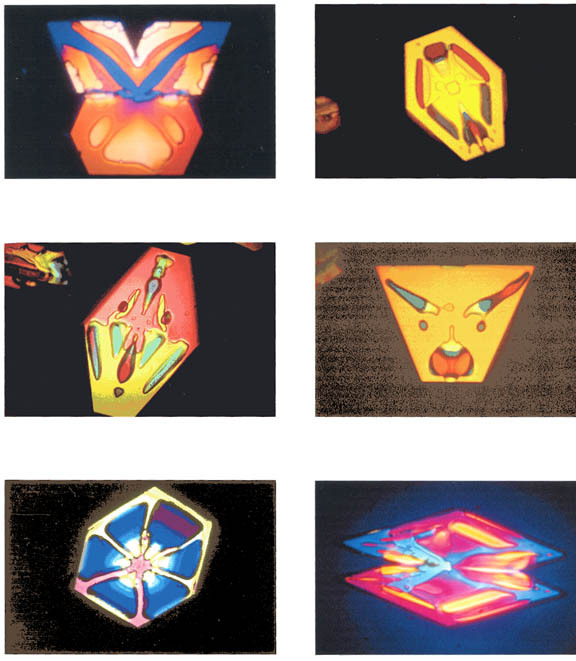 Images of hyroquinone between crossed polar filters.